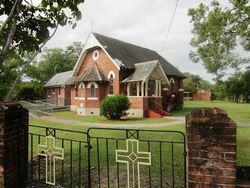 St Barnabas Anglican Church was erected in memory of those who died in service or were killed in action during World War One. The foundation stone was laid in 1919 and the church was dedicated on Armistice Day 1920. A large crowd of parishioners attended the memorial service in St. Barnabas' Church, of England on Tuesday last. Chaplin Greville preached a very eloquent sermon, stating that this new building was being erected in memory of the fallen lads, and he appealed to all to generously assist. As the result some 76 memorial bricks were placed position, each donation of 10s entitling the donor to do this. Northern Star (Lismore, NSW), 27 July 1920. On Sunday, November 11 (Armistice Day), St. Barnabas' Memorial Church of England was consecrated by Dr. Ashton, Bishop of Grafton, in the presence of a large congregation, including visitors from surrounding parishes. The church was decorated with November and arum lilies and red, white and blue ribbon streamers. 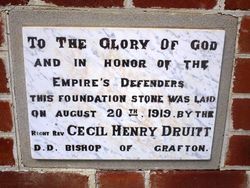 The foundation stone of this church was laid by the late Bishop Druitt on August 20, 1919. The following year on Armistice Day Archdeacon Tress dedicated the building, Bishop Druitt being absent in England, and on Sunday last, three years later, the church was consecrated. Before the service a two minutes' silence was observed. The vicar read the petition asking the building to be consecrated. The church committee formed in procession and preceded the bishop and clergy up the aisle. The service of consecration was solemnized by the bishop. Northern Star (Lismore, NSW), 19 November 1923.